A parliamentary report of 1777 recorded parish workhouses in operation at Warwick St Mary's for up to 89 inmates, and at Warwick St Nicholas for up to 44. By 1835, Leamington had premises on Court Street with Richard Dunsby as master. County of Warwick: Ashow, Baginton, Barford, Beausale, Bishop's Tachbrook and Tachbrook Mallory, Bubbenhall, Budbrooke, Cubbington, Eathorpe, Haseley, Hatton, Honiley, Hunningham, Kenilworth (3), Leamington Priors (4), Leek Wootton, Lillington, Milverton, Norton Lindsey, Offchurch, Pinley, Radford Semele, Rowington (2), Sherbourne, Shrewley, Stivichall, Stoneleigh (2), Wappenbury, Warwick St Mary (4), Warwick St Nicholas (2), Wasperton, Weston under Wetherley, Whitnash, Wroxall. Later Additions: Blackdown (from 1894), Guy's Cliffe (from 1862). The population falling within the union at the 1831 census had been 28,924 with parishes ranging in size from Pinley (population 15) to Warwick St Mary's (6,678). The average annual poor-rate expenditure for the period 1834-36 had been £12,245 or 8s.6d. per head of the population. A new Warwick Union workhouse was erected in 1837-9 at a site on the east side of what became Union Road, now Lakin Road. The Poor Law Commissioners authorised an expenditure of up to £8,000 on construction of the building which was initially to accommodate 200 inmates. It was designed by W Watson who was also the architect of the Walsall Union workhouse. Its layout was based on the double-cruciform plan, a relatively uncommon layout found in only a few other workhouses such as those at Henstead in Norfolk, and Stroud in Gloucestershire. The central block contained the board-room, administrative offices, and Master's quarters. Separate male and female accommodation was placed at each side. In April 1837, a tender of £4,795 for the construction work was accepted from a Mr Clarke. However, in November of that year, his poor progress led to his being dismissed and the work was completed by Mr Samuel Bird for £2,943. The building was completed by November 1838 and was declared ready for the receipt of paupers on 16th February 1839. In February 1840, the old St Mary's workhouse was sold off for £900. In 1845, additional accommodation costing £235 was approved. The Guardians' minutes also record the ordering of 36 new iron bedsteads. In 1894, the British Medical Journal set up a "commission" to investigate conditions in provincial workhouses and their infirmaries. Following a visit to Warwick, the commission's report made a number of comments and recommendations. The infirmary was noted as being rather cramped and there was a lack of day-rooms. The windows in the wards were too high up for the patients to be able to see out of. Toilet facilities were limited, with chamber pots being provided under each bed. A separate labour ward was needed. There was no night nurse, the provision of which would help lighten the load on the daytime staff. Further details are available in the full report. After 1930, the former workhouse became known as Warwick Infirmary, then subsequently as Warwick Hospital. Virtually all the former workhouse buildings have been demolished. Parts of the 1903 infirmary remain. Warwick workhouse infirmary site from the north-east, 2000. By the early 1900s, the Warwick Union had established a number of children's scattered homes. In 1908, these were located at: 'Culham', 40 Grove Street, Leamington; 'Walworth', 9 Charlotte Street, Leamington; 'Fortescue', 16 Willes Road, Leamington; and 'Lammas', Linen Street, Warwick. Other homes were later opened at 11 Charlotte Street, Leamington, 'Barmouth', at 13 Charlotte Street, and at Pinley House, Rowington. By 1924, the homes could accommodate a total of 105 children. A Receiving Home for children entering the care of the union was also opened at 1-3 Wharf Street, Warwick. 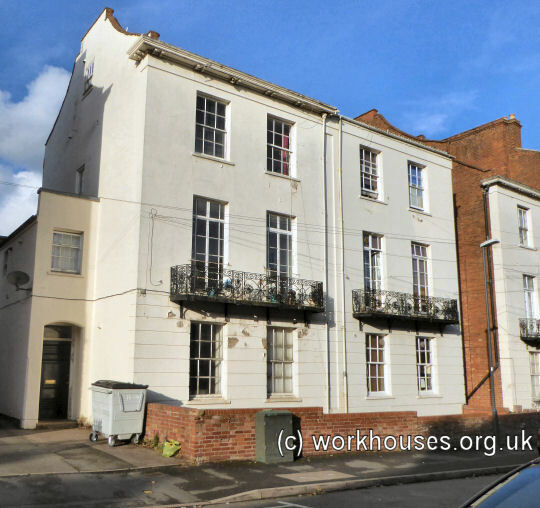 Former cottage homes at 11-13 Charlotte Street, Leamington Spa, 2016. Warwickshire County Record Office, Priory Park, Cape Road, Warwick CV34 4JS. Holdings include: Guardians' minute books (1836-1930); Accounts (1836-1930); Admissions (1914-37); Creed registers (1879-84, 1910-13); Vaccination registers (1855-1917); Register of lunatics (1918-22). A History of Warwick Hospital 1836-1903 by JN Holden (Warwick Hospital, 1988).